KUWAIT: National Bank of Kuwait Deputy CEO Shaikha Al-Bahar said yesterday that the banking system in Kuwait is among the healthiest in the region. 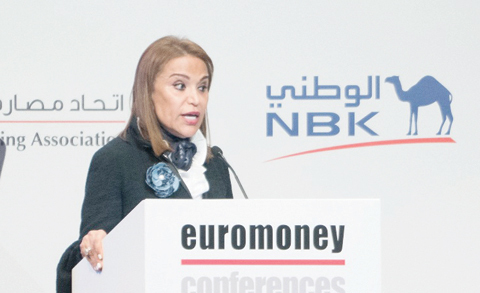 “Our banking system is very well positioned for future growth and well-equipped to absorb any economic shocks,” she said addressing the 10th Euromoney Kuwait Conference 2018 yesterday. 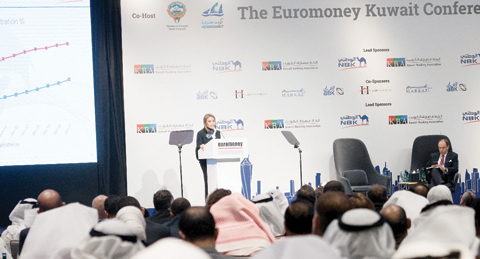 KUWAIT: Shaikha Al-Bahar addresses the Euromoney Kuwait Conference yesterday. Good morning everyone. I am flattered to be addressing you today in the presence of such an outstanding crowd. I want to talk to you today about the future of banking in Kuwait, a topic that comes with a lot of optimism, in my view. The Kuwaiti banking sector is well-positioned for a positive cycle with lots of opportunities. I would like to focus on two main areas that will create a lot of future opportunities for banks in Kuwait; (1) Kuwait’s 2035 vision and (2) Technology and digitization in banking. But before I get to that, I want to spend some time on our journey as Kuwaiti banks over the past decade, more precisely since the global financial crisis. This is very important as it marks a very interesting era for the banking industry not in Kuwait, not in the region but globally. But also it is a very important phase for the banking system in Kuwait as it shaped our present. As a banking sector, our strength today, our future outlook and our capacity to support the development of Kuwait is all the outcome of the wise actions taken during the past decade with all its instabilities. Over the past decade, the landscape of banking changed dramatically across the world. We saw banking industries shrink, governments intervene, and financial giants disappear. We also witnessed mergers, divestitures, and bankruptcies. Our region went through similar waves of changes, not as severe as the developed markets, but we had our share of economic and geopolitical turbulences. In the region, we faced the spillovers from the damaged economies in the larger, more developed economies as well as the volatilities and imbalances of emerging markets. More importantly, we also went through a tough regional challenge, the Arab spring. These are all challenges that can lead to the fall of economies and the collapse of banking systems, but look where we are today. Generally, our regional markets banking systems held-up very well. But more interestingly is the banking sector in Kuwait which emerged from that era much stronger and significantly better-positioned for the future. Now, allow me to put in simple words what the financial systems went through in the past decade. Exactly ten years ago and on September 15, 2008, Lehman Brothers filed for the largest bankruptcy in history. This was followed by a global meltdown of financial markets, and a wave of failures hitting the largest financial institutions in the world. Although most of MENA countries had limited integration with global financial institutions at the time, but the impact of the crisis was inevitable. Transmission channels ranged from global economic recession, plunging asset prices, a lower price of oil and drying out of global liquidity. This all led to the contagion effect that we saw in our regional markets despite very limited direct exposures to the US subprime debt, which was the main cause of the problem. GCC was no different, asset quality turned very doubtful, refinancing needs became more challenging, and credit growth started slowing down. This all translated into sector specific issues like the downfall of the property market, the failure of some large conglomerates and the well-known collapse of the investment companies in Kuwait. In Kuwait, and during the years preceding the crisis, credit growth was relatively high with concentrations in the real estate, share purchases, and investment companies sectors, all were hit hard by the crisis. As a result, the banking sector came under pressure with asset quality deteriorating leading to a growing provisioning gap. Before we see any recovery, the region erupted again on the back of the Arab Spring. Across most countries in the region some sort of instability was looming leading to more pressure on the financial systems. In the GCC, governments acted promptly and aggressively introducing fiscal stimulus packages to trigger economic activity and soften the impact of the global recession, with aim of restoring confidence and stabilizing the domestic markets. The Government instantly issued a new law guaranteeing bank deposits and introduced the financial stability law. Similarly, the Central Bank of Kuwait (CBK) took a very proactive approach during those tough years acknowledging the risks that emerged in the sector as a result of previous exposures and working on multiple fronts to restore the system credibility. The Central Bank of Kuwait (CBK) adopted a balanced and gradual approach in implementing financial regulations to increase system resilience without jeopardizing economic recovery. To address system NPLs, the biggest challenge at the time, CBK adopted a conservative provisioning approach which required banks to build precautionary provisions to build system provisions to acceptable levels. And at a later stage, adopted Basel 3 requirements improving capitalization with focus on core capital. What does this all mean for us today? As someone who has been involved in banking for many years, I can comfortably say that the banking system in Kuwait is among the healthiest in the region. Very well positioned for future growth and well-equipped to absorb any economic shocks. Asset quality is at its best with a record low NPL ratio approaching 1.9 percent and a record coverage of around 230 percent. Capitalization is very comfortable across the system with levels exceeding all international standards and mostly driven by core capital. Corporate governance, risk management practices, liquidity levels, concentrations, quality of banking practitioners, have all improved over the years, putting banks’ practices at par with their counterparts in the developed markets. I know I spent some time detailing how significant the challenges were, and how fruitful the efforts to tackle them, have turned out. I am stressing on this long journey as it helped restore confidence in the banking sector in Kuwait and brought us to where we are today. Now let me just switch gears to focus more on the future of banking, and where we see opportunities. 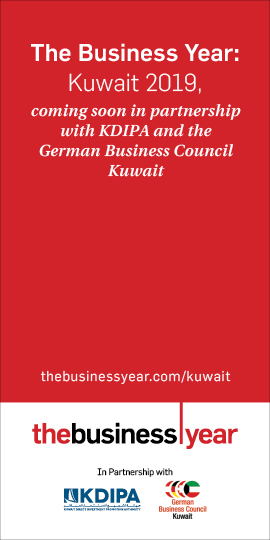 And as I mentioned in my introduction, I would like to especially focus on two main areas; Kuwait’s 2035 vision, as well as technology and digitization in banking. I derive my optimism from the headline of Kuwait’s national development plan, which describes it as “A consolidated approach towards a prosperous and sustainable future”. Our national development plan stems from his Highness the Amir’s vision of a new Kuwait by 2035. The plan revolves around seven key pillars of focus, targeting the transformation of Kuwait into a leading Regional, Financial, Commercial, and Cultural hub by 2035. The banking sector in Kuwait will have a major role to play in supporting the government in the implementation of some of these pillars, but most importantly in the development and modernization of the national infrastructure. We have seen in recent years, a marked pick-up in activity related to tendering and awarding of projects as part of the upgrade of Kuwait’s infrastructure. This is happening across all sectors, confirming the government’s commitment to the development plan. The projects currently underway are quite diversified, including, upstream and downstream oil sector, transportation, healthcare, housing, and utilities. This will further improve private sector activity and sustain economic diversification. Total project awards and execution, will remain a key driver of non-oil growth over the next few years. Awards proceeded at a steady pace in 2018, are projected to pick-up going forward. We foresee large investments focused on the transportation and construction sectors. This level of activity is expected to continue, and we are very optimistic around the pace of project execution. With this elevated level of activity taking place in our domestic market, banks will play an important role to support the long term development of Kuwait’s infrastructure. This role comes with a lot of opportunities from simple lending activity to more complex transactions as well as, consulting, trade facilities, capital markets, and other ancillary banking business. The opportunity we have as Kuwaiti banks goes beyond the elevated levels of activity. Kuwait’s development plan, considering its size is attracting a large number of highly qualified regional and international corporate and financial institutions as we just heard from Dr Meshal Al-Sabah. 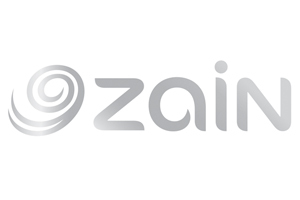 This will improve the banking industry in Kuwait through transfer of best practices and industry high standards. Another important area of relevance stems from our belief, that the future of banking is technology, and for banks to cope they need to spend on building IT platforms and investing in their back-end and front-end technologies. The world of banking is being transformed through technology. Digitization is becoming not only an exciting topic for banking executives but it is turning into an area requiring significant financial and human resource allocation. With today’s pace…, very soon, technology will drive everything in banking. We have already seen significant developments in recent years that would have been considered fiction ten years ago. We have seen the rise of Fintechs over recent years, as a result of growing demand for technology-based financial services. This is a trend that will not slowdown any time soon. Disruptive technologies will influence the financial sector the same way it has influenced and fully transformed other industries. We all know how the likes of Apple, Amazon, Netflix, YouTube, Facebook and others led to a full transformation of industries like telecommunication, retail, and entertainment. This was followed by the downfall of industry leaders, who failed to cope. Banking is no difference. With mobile penetration and internet usage on such a rise, digital transformation of banking services becomes inevitable. Innovation will be the growth driver for banks going forward especially in our region where the population is very young and highly tech savvy. In today’s world, we are already in the era of internet and mobile banking, contactless transactions, digital wallets, virtual currencies as well as other under-developed technologies. That said, technology is taking large leaps and very soon banking platforms will have to accommodate artificial intelligence and robotics as a common standard for both banking operations as well as customer transactions. With the growing excitement around technology and innovation in banking, there is a growing risk as well. We all know the increasing concerns around the world from cyberattacks, data piracy, and manipulation, as well as transactional fraud. These trends put pressure on us, as banking executives to not only invest in technology and digitization, but also to give similar attention to the risks associated with this emerging trend. Finally, I hope my words have articulated my optimism around the future of Kuwait and the potential for our banking sector. But, as someone, who cares about this country and is keen to see all that optimism transforming into reality, allow me to conclude with few words that might seem slightly out of topic. Our future plans are worthless if we don’t have the human capital for execution and sustainability. I am very glad that human capital is among the main pillars of our national development plan as we need to continue to rationalize and improve our educational system to produce better candidates, who are highly qualified, more competitive with the skill set needed to drive our future.